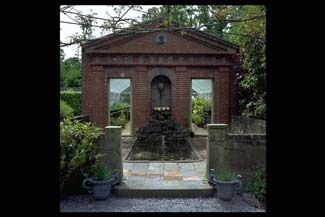 Deeply satisfying restored walled garden with garden rooms. 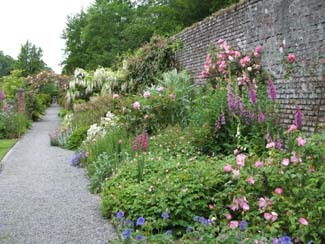 The spicy scent of clipped box, bees drowsy with heat, fruit ripening against sun warmed brick and herbaceous plants pampered into magnificence: Lodge Park has all the magic to be expected of a walled garden and more. Originally dating back to the 18th century like the Palladian house, the present incarnation of the garden dates from the 1980s. 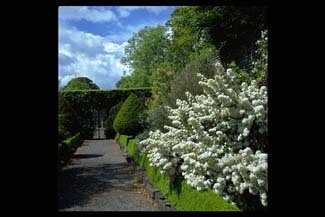 A path between borders, their billowing plants and shrubs contained by box clipped into hedges and pyramids, offers a vista down one side of the garden and also access to a series of ‘rooms’, walled with beech hedges. Each one of these would make a pleasing garden in its own right and everyone has a favourite area. 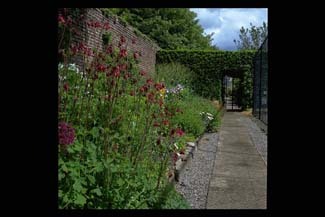 It might be the white and silver garden filled with phlox, lambs ears, nicotiniana and white agapanthus or the salad garden, with patterns made from the serried ranks of lollo rosso, lettuce, scarlet stemmed chard and chives, laid out among geometric brick paths. 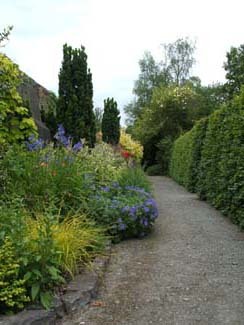 It could be the handsome herbaceous border beside the tennis court, full of stately herbaceous plants like yellow centurion, erigerons, hollyhocks and pale sunflowers. And the scent within the canopy of the wrought iron rosarie made by Brendan Walsh is enough to make the senses swoon with the fragrance of old roses like ‘Rambling Rector’ and ‘Wedding Day’. 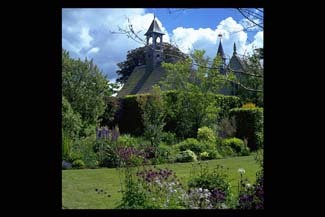 The working kitchen garden, screened by a sweet pea pergola and hedged in espaliered apple trees, filled with chard, asparagus, soft fruit and other treats, usually appeals to the non distaff side of the family. There are plenty of other attractions too. Given the steam museum - with a collection of model engines and steam engines used for distilleries and breweries, and the Steaming Kettle Tea Rooms with sinful chocolate cake, and the gift shop - Lodge Park makes a good venue for a family outing. 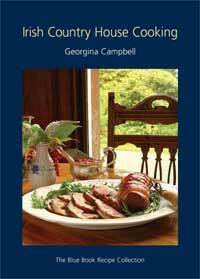 Pre-booked groups are welcome for morning coffee, lunch or tea in Steaming Kettle Tea House. Just outside Straffan. Turn off the N7 at Kill for Straffan.